Steve enjoying the solution to our first world problem. It’s been hot. Ridiculously hot. Today’s mountain bike ride with hubby, undertaken at 10:30 a.m., was conducted in 91 degree heat. By 2 p.m. when we were driving to REI our car registered a balmy 102. Three days ago, we saw 104 degrees, just one degree shy of the highest ever recorded temperature in Denver. To make matters worse, the entire state is a tinderbox. Firefighters are currently battling thirteen wildfires, which is five more than they were battling this morning. The smoke hangs heavy in the air reminding us that not only is it hot but it’s flaming hot. I’m starting to wonder when Satan will drop in for a visit because Hell is feeling a little chilly by comparison. Tonight we’d planned to go to a neighborhood concert in the park, but as 5 p.m. rolled around we realized there was no way we were sitting outside for two straight hours in the hot, hot heat. Instead, we came home and collapsed in the air-conditioned comfort of our house. Then, the seemingly impossible happened. There was cloud cover and a slight breeze. We ventured out into the backyard to sit on our lovely flagstone patio, a patio that we haven’t had much of an opportunity to enjoy yet this summer. As we sat at our wrought iron table in the shade of our Japanese maple tree, we were still mostly baking. While the sun had abated, the heat remained far too noticeably. “This sounds like a first world problem,” Steve replied, hoping to shut me up. “You can always go back into your air conditioned house,” he suggested. It was a delicately veiled attempt to get rid of me, though, and I was not going that easily. 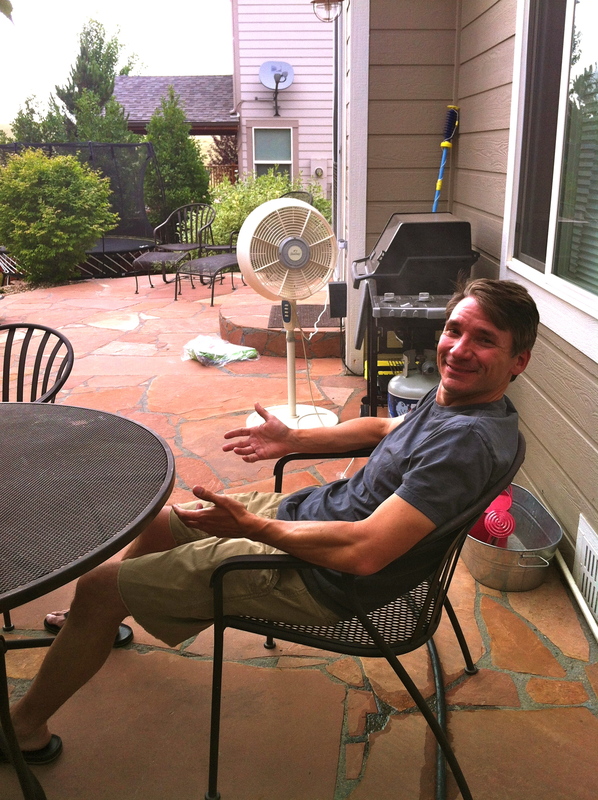 A few minutes later Steve emerged with this enormous fan that his parents had bought us years ago. I balked when it had arrived, wondering when we would use such a thing and where we would store it when we weren’t using it. In fact, we’d only used it once, about four summers ago. The past several summers have been far too cool and wet to warrant its presence. Steve plugged it in, hooked it up to the hose, and voila! We were enjoying the wasteful luxury folks in Vegas and Phoenix know so well…a misted patio. The misted patio, of course, needed happy hour drinks. We poured ourselves a couple cocktails, settled back into our chairs, and reveled in the comfort provided by our own personal patio saver. We spent a couple minutes discussing how fortunate we are to have first world problems and not third world problems. Our eleven year old, who had joined us briefly, inquired about the difference. “You die of thirst,” Joe answered. “Right,” I said. “And what happens if you lose your iPod charger?” I asked him. “You buy a new one,” he replied. “Uh huh,” he said, thoughtfully, before departing for the frigid basement. As we sat reflecting on how blessed we are to have only first world problems to deal with, I realized that the metal chair I was resting my flip-flopped feet on was a bit hard on my heels. “I need a pillow for under my feet,” I told Steve, hoping he would take the hint. “Looks like you have a new first world problem,” was his answer. Justine, you are an amazing writer. Your stories always make me smile and think! You rock and can’t wait to see you guys this weekend! Thanks soooo much for riding!